When China’s Growth Ends, What Next? At the 2016 Davos World Economic Forum, George Soros issued a stark prognosis about the future of the Chinese economy: “A hard landing is practically unavoidable.” Although few China watchers are willing to make such bold predictions, many observers suspect that China’s three decades of rapid economic growth are about to come to a close. What implications will this have for Chinese politics? Such questions are challenging to answer. Sure, a massive economic crisis would pose a significant threat to the current regime, but what if the end of China’s high-flying growth path is just a return to more modest rate of economic growth, or just a mild crisis? What can we expect? It is particularly hard to answer questions like this because China is so exceptional—so large, so systemically important, and has enjoyed so much success over the past thirty years. But the question is critical for Chinese and global politics alike nevertheless. In a new paper (PDF), Jeremy Wallace and I take up the task of answering it. Our first contribution is to put some structure on the question of China’s future, to show what we can and cannot learn from historical and comparative experiences. Our second and larger contribution, though, is to introduce some terminology to understand what Soros had in mind when he said “hard landing.” The image below—Figure 1 in the paper—captures what we have in mind. 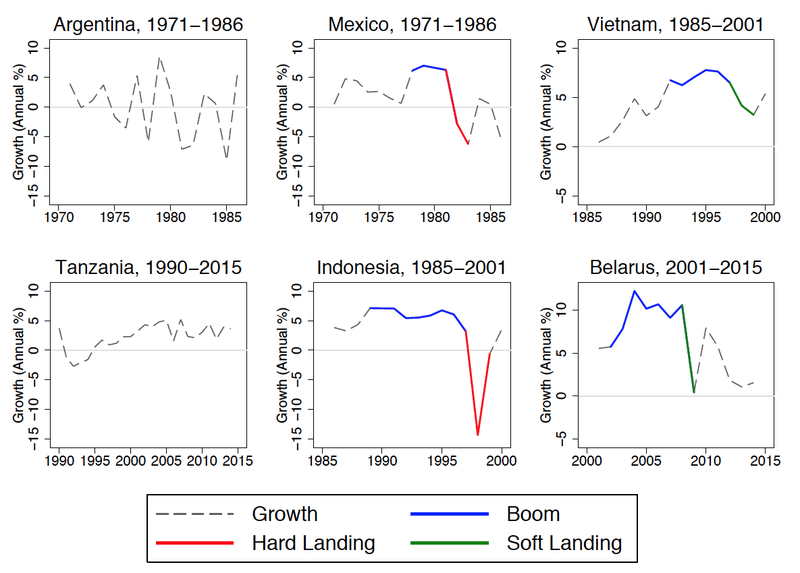 We propose that there are important differences among “busts,” “soft landings,” and “hard landings,” and show empirically that they tend to have different political consequences in authoritarian regimes such as China. In a move sure to annoy some in Beijing and elsewhere, we also highlight how the experiences of Indonesia and Vietnam are particularly helpful for anticipating what’s next for Chinese politics.